On the evening of Tuesday 6th November, as citizens in the United States were voting in their presidential election, there were two, contrasting events taking place at the US embassy in London. Inside the embassy building, swathed for the occasion in huge laser images of the star spangled banner, invitees to a celebratory party entertained themselves via TV relays of the unfolding results while being fed and watered. 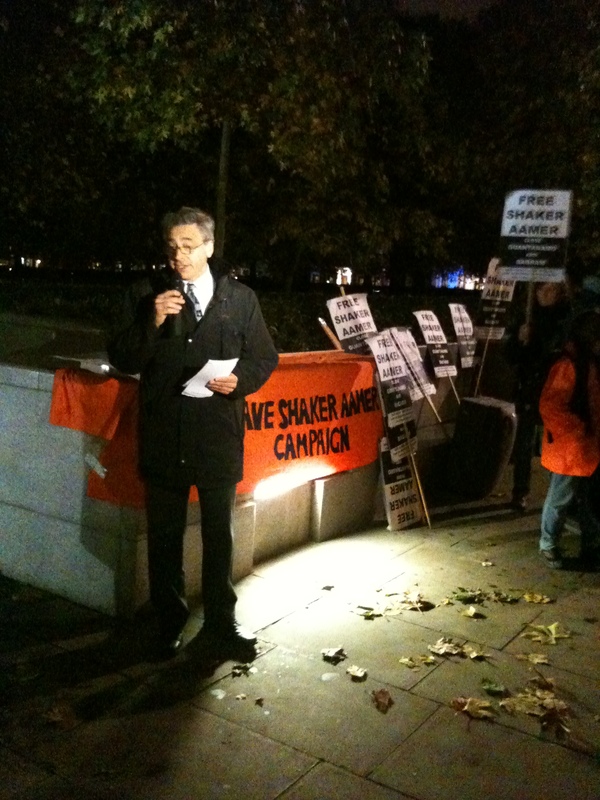 Outside, on a chilly autumn evening, activists gathered. The protest, “Truth, Justice and the American Way?”, called by the London Guantanamo Campaign, brought together several groups representing the victims of US militarism, torture and extradition to highlight not only Barack Obama’s broken promises on Guantanamo and whistleblowers, his prejudicial comments on Bradley Manning and his administration’s continued use of the dark arts of rendition, torture and borderless drone warfare but also the likely expansion of these policies in the event of a Mitt Romney foreign policy. We are with you in spirit and are completely in solidarity with you. We will, once again be at the gates of NSA Menwith Hill tomorrow night (weekly Tuesday 6-8 pm demonstration – now into 13th year) and will display our large banner that we often put up which says “The Shame of Guantanamo Bay”. We had it done when this terrible place was opened by the disgraceful GWB. Another theme was the power of the written letter, of which Joy Hurcombe and Shahrar Ali reminded everyone. Dr. Ali’s reading of his own letter to Guantanamo detainee and UK citizen Shaker Aamer, beautifully written, poignantly and powerfully delivered, was perhaps the highlight of the evening. 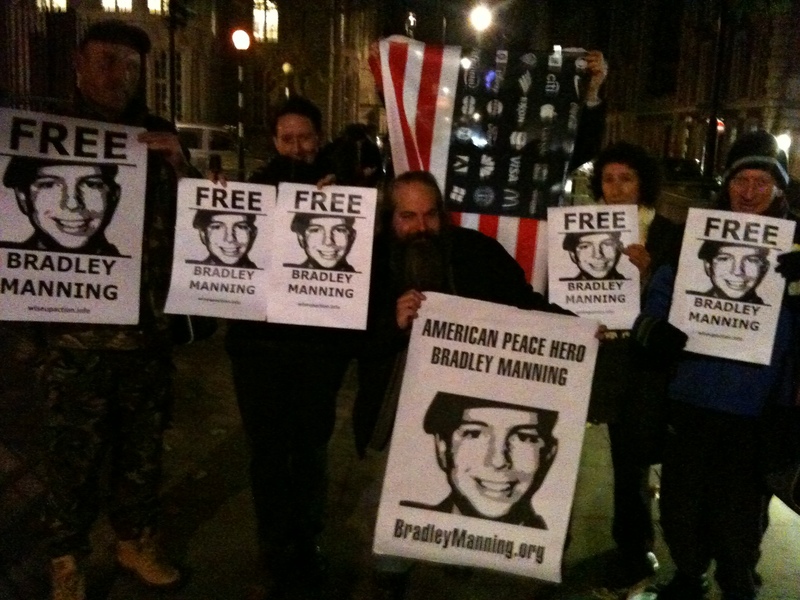 There was good support for Bradley Manning from WISE Up folks – including Clara and Tom who had made their way over from the Ecuadorian embassy earlier in the afternoon – and strong solidarity from other groups, all very familiar with Bradley’s bravery and his treatment. This was a vibrant and diverse event uniting groups who share common concerns: US military aggression, the illegality and racism of US foreign policy and the brutal treatment of citizens who become caught up in or oppose US wars. Solidarity to all those who attended. Thanks for inviting us. 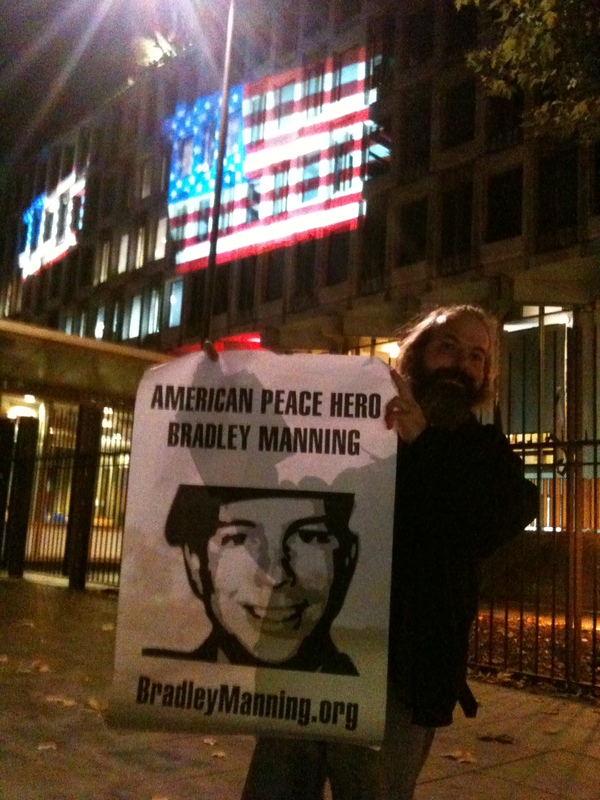 Gallery | This entry was posted in Manning, Reports and tagged anti-militarism, anti-war, Bradley Manning, demo, London, solidarity, torture, US Embassy. Bookmark the permalink.